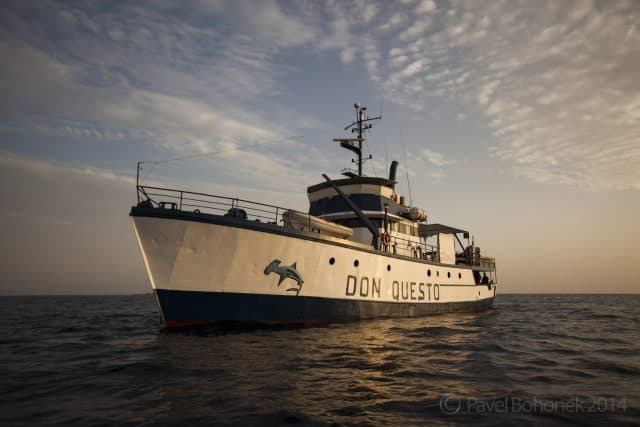 The Don Questo is a former trawling vessel, turned into an oceanographic research vessel and now operates as a liveaboard in Sudan. 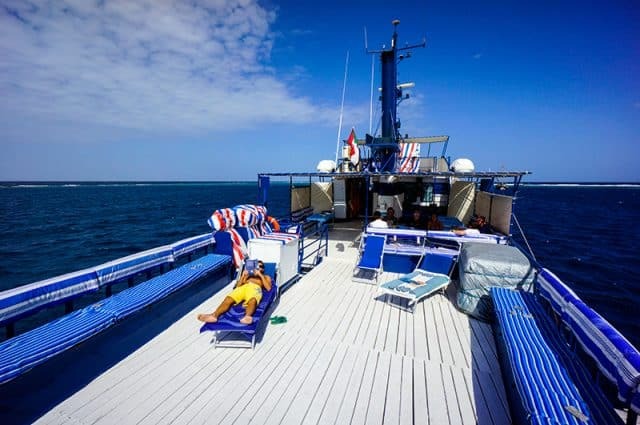 Indeed, the 33 meters liveaboard offers scuba diving cruises from Sudan, going on the Red Sea. The ship has undergone a complete overhaul in 1998 and turned into a liveaboard vessel. Ever since, it’s been upgraded and maintained to the industry standards every year. The Don Questo can welcome up to 17 guest on-board each voyage as it features a total of 8 cabins. Indeed, with 7 cabins being available for double-occupancy and 1 cabin hosting up to 3 divers, there’s plenty of space for everyone. The cabins all features a sink, plenty of storage and air-conditioning. Moreover, there are 4 showers and 5 toilets available for all the guests to share. Visit this page to compare liveaboard & prices for the Red Sea! 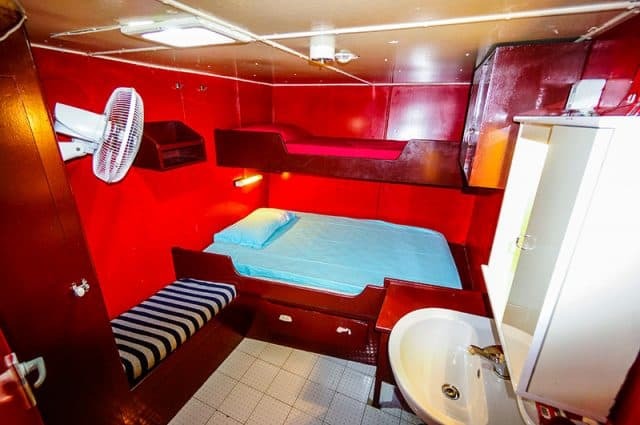 The dive boat offers plenty of generously sized communal areas. Indeed, the main salon is big and cozy, featuring a hi-fi system, television and DVD player. Moreover, the open-air dining area comfortably seats 20 and allows a nice view while you enjoy your freshly cooked meal. Furthermore, if you walk up to the sundeck, you will be glad to find ample space to soak up the sun rays. There are mats and sun loungers available. The Don Questo proudly boats that the sundeck is the guests favorite spots. We get why, it’s perfect for some yoga making or even to enjoy a starry night sky on the Sudanese Red Sea. 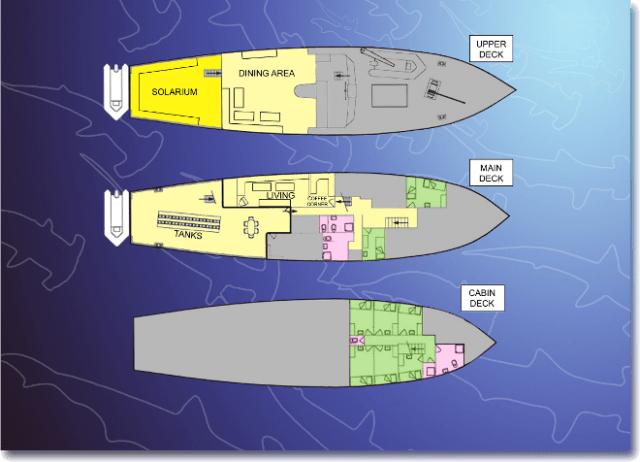 The Don Questo is a big ship and features all the navigation technologies needed on a scuba diving trip. The layout of the boat is made spacious and well organised. Power and hot water are on-going thanks to many generators and even a soundproofed one is scheduled for the night time. The ship has an oversized dive deck which is incredibly well organized. Tanks are aligned on a bench and filled in there sockets, all you have to do is gear up and go! 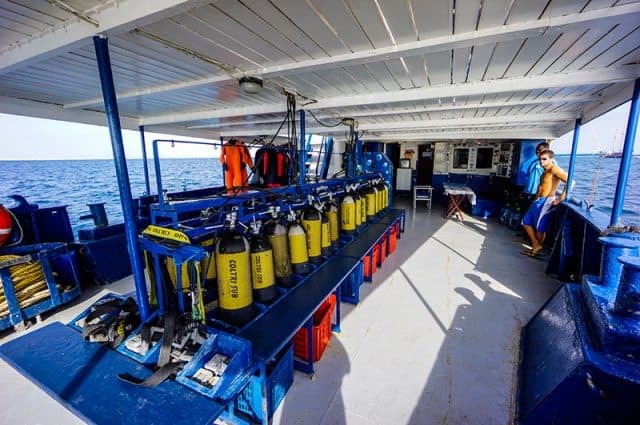 Moreover, the hydraulic dive platform makes the scuba diving operation a whole lot easier. Indeed, entering the water or the zodiac is a breeze with the platform. Plus, the professional crew is always there to assist you with your gear or during the underwater exploration. Finally, the Don Questo, as they state, is the only vessel in Sudan with a recompression / hyperbaric chamber on-board. Safety is indeed taken very seriously. Please visite the boat’s webpage to see price lists and schedules. If you have been diving on board this liveaboard dive boat in Red Sea & Sudan, please share your review and let us know what you thought. Please post your comments in the review section below, by doing so you will help fellow divers to plan their next diving trip . No Liveaboard Review yet on this page, please comment if you have been on the Don Questo cruise. The Don Questo takes divers to the Sudan side of the Red Sea to explore the pristine marine world.